Reeves and Sons Ltd 1891-1976. Lincoln Road, Enfield, Middlesex 1921-1982.
c.1766 William Reeves (1739-1803) was apprenticed as a gold-and-silver wire-drawer. He set up in business as a colourman in or before 1766 when he advertised in the Morning Herald. 1768 He went into partnership with his older brother, Thomas Reeves. 1781 Together they were awarded the Silver Palette of the Society of Arts, for the invention of the watercolour cake. From their address at 2 Well Yard, Little Britain, William and Thomas Reeves advertised as 'Superfine Colour Makers', with the claim that the business prepared 'all sorts of fine Colours to the greatest Perfection'. 1782 They advertised "upwards of forty neat colours for Miniatures, Landscape, Portrait, Mapping etc", also advertising superfine crayons, pencils in cedars of all colours, all sorts of crayons in setts, equal to the Italian, and every article useful in drawing, giving their address as 80 Holborn Bridge, removed from Little Britain. 1783 The partnership broke up, supposedly because of a dispute on the supply of their paint cakes to Rowney. 1784 The partnership was dissolved on 16 December, according to William Reeves's advertisements. Thomas Reeves then set up in business independently (see below, under Thomas Reeves and Son), while William Reeves is said to have taken his son-in-law, George Blackman into the business, probably as an assistant, rather than as a partner as is sometimes said. William Reeves moved to 299 Strand. He advertised from this address that, as superfine colour manufacturer, he had 'made it his chief study for upwards of eighteen years to invent his superfine Cake Colours'. 1796 Reeves and Inwood: The partnership between William Reeves and John Inwood was in existence by 1796, when it advertised its products. 1803 William Reeves, colour manufacturer of Islington, died without mentioning his business in his will, suggesting that he had already given up his interest. 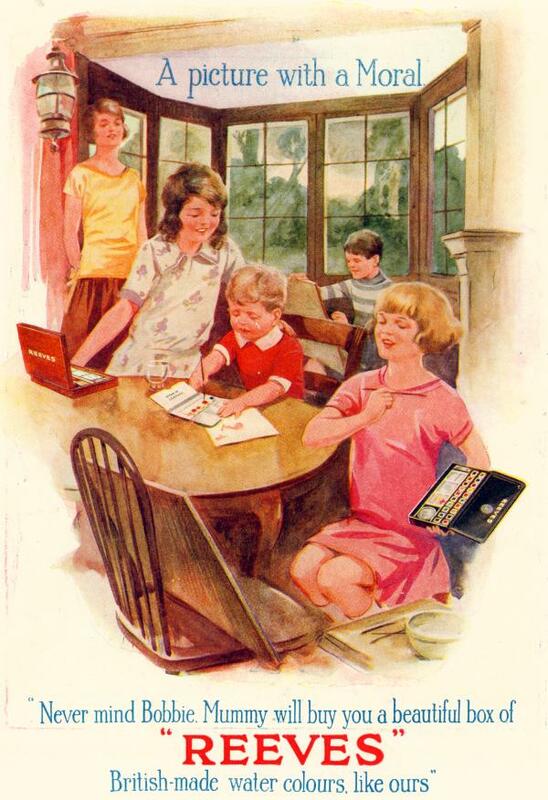 Reeves and Inwood advertised as Superfine Colour Preparers. John Inwood continue to trade under the Reeves and Inwood name although by 1811 he was also listed under his own name in the Post Office directory. The Reeves name was an attractive one to use for a business of this kind but it is clear that William Reeves gave up his interest in the business in or before 1803 and that John Inwood would seem to have sold out to the Driver family by 1816. Warehouse at 92 Strand 1785-1786 or later. From 1783 until at least 1811 and possibly as late as 1816, there were two rival businesses trading by the name of Reeves. But it was that of the elder brother, Thomas Reeves, which became the celebrated 19th-century business which continued until the late 1970s and which has recently been revived. Thomas Reeves (1736-99) set up in business on his own at 80 Holborn Bridge, following the breakup in 1783 of the partnership with his brother, William Reeves at this address. For his early career, see William Reeves. From 1784 he was trading as Thomas Reeves and Son or as T. Reeves and Son. For example, in 1790 the business was listed both as T. Reeves and Son, colour manufacturers and as Thomas Reeves and Son, superfine colourmen. William Reeves subsequently claimed that Thomas had been a scalemaker previous to the year 1780 and that he had hired his brother as a journeyman and servant in 1780 before taking him into partnership until its dissolution on 16 December 1784, however the partnership probably fell apart in or around December 1783. The business held an appointment from 1790 as Colourman to Her Majesty (Queen Charlotte) and the Prince of Wales, afterwards George IV. The export of materials to India was an important part of Reeves's trade as early as 1786; for further details see below. 1799 Thomas's son, William John, continued in the business after Thomas's death. Thomas Reeves died in August 1799. His will had been witnessed by William Woodyer in April 1797. His son, William John Reeves (1764-1827), succeeded to the business and briefly traded in his own right, advertising under his own name before going into partnership with Woodyer, advertising as Reeves and Woodyer in April 1800 and as W. J. Reeves and Woodyer (late T. Reeves and Son) in 1801. The business used the same designation, W.J. Reeves and Woodyer (late T. Reeves and Son), on its trade label. In 1817 and 1818 various directory listings for the business take different forms including Reeves, Woodyer and Reeves, Reeves and Woodyer and Woodyer and Reeves, suggesting that the company partnership arrangements were undergoing change, as William John Reeves's son, James Reeves, (1794-1868) was taken into the business. Subsequently in 1827 another son, Henry Reeves (1804-77), joined the business. What happened to William Woodyer is not known but it is worth noting that a man of this name, resident at Grosvenor Place, Camberwell, was recorded in the 1851 census, age 75, and died in 1852. By 1819, William John Reeves was 65 and the business was renamed W. J. Reeves and Son. The business traded as such until soon after William John's death in 1827, when it became Reeves and Sons. William John Reeves was variously listed as artist in watercolours. In 1829 the two brothers, James and Henry, relocated the business from Holborn Bridge to 150 Cheapside, a move which has been described as misguided in view of the general tendency of artists to move further west in London (Reeves typescript history, see below). Premises were also opened in Throgmorton Street in 1831, which continued in use until 1857. James Reeves retired in 1847, and in the following year two of his nephews, the brothers Henry Bowles Wild (1825-82) and Charles Kemp Wild (1832-1912), were taken into the business; they were both listed as artists' colourmen in the 1851 census, ages 26 and 18, residing with their father, Henry Wild, a wine merchant at 98 St Martin's Lane. On the retirement of Henry Reeves in 1866, control moved to the Wild family who made the decision to remove manufacturing from Cheapside to a much larger site that they had acquired in Dalston, building a four-storey factory for £3200. 1868 In London City Press of January 18th 1868 the name of the architect (E. H. Horne) of the Reeves Dalston Factory was announced with a list of builder's tenders. Successful tender was from Sewell and Sons for 2,343 pounds. In the 1881 census Charles K. Wild was listed at Thornlea, Fitzjohns Avenue, as Artists' Colourman, employing 56 men and 22 boys. Over the previous few decades the Wilds had added as customers the Science and Art Department at South Kensington, the War Office, the Ordnance Survey Office and, in 1875, the new London School Board, subsequently the London County Council. The business had an account with Roberson as W. J. Reeves and Son, May 1821 to February 1822, and as Reeves and Sons, 1828-1908. It supplied some pigment samples to George Field for testing and later subscribed to his Chromatography, 1835. It submitted samples of new wax colours to the Royal Society of Arts in 1849 and received an award for their most colours at the Great Exhibition in 1851. Reeves's watercolours were stocked in London, Edinburgh and in Australia. As Reeves and Woodyer, the business had advertised as 'colour-makers to the Honourable East India Company'. This trade grew in significance in the 1820s and 1830s and subsequently Reeves's annual income from the East India Company amounted to as much as £6,000, 25 to 30% of the firm's overall turnover. 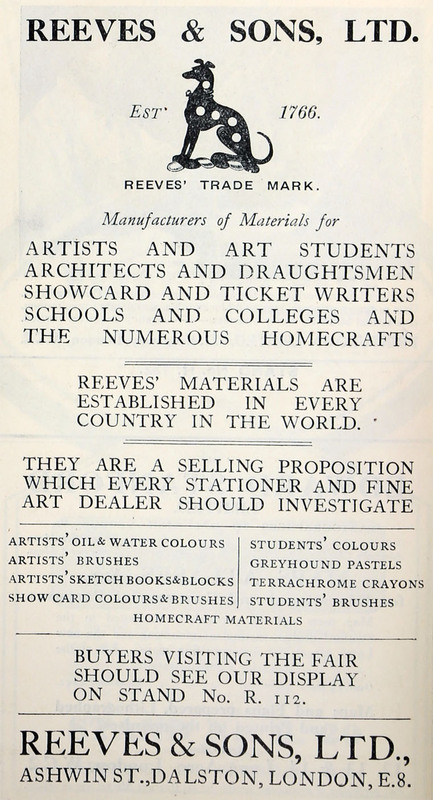 Reeves advertised in The Art Union, for example, as the sole agent for Spillsbury's watercolour preservative, advertising new fresco panels and vitrified fresco colours, patented in 1842, and warning against black lead pencils fraudulently marketed as being made by them. Also their Cartoon Pencils, registered 1843, requiring no pointing and wax watercolours in cakes. Their 1856 catalogue included watercolours, moist watercolours, boxes of watercolours, oil colours in collapsible tubes, powder colours, oils and varnishes, brushes, drawing papers, Turnbull's Bristol Boards and Mounting Boards, drawing and sketch books, pencils including a section of 'Remarks on the lead pencil', chalks and crayons, mathematical drawing instruments and accessories. A more complete catalogue of 1863 included a wider range of products. A good sequence of catalogues from 1852 is housed at Winsor and Newton. Reeves published some instruction manuals for artists from about 1852, but many fewer than Rowney or Winsor and Newton. Very few early marked canvases are known, suggesting that the supply of canvas may not have been a significant part of their business at this stage. 1882 Following the death of Henry Bowles Wild in 1882, his brother, Charles K. Wild, became head of the business, and was followed in 1896 by his son, Charles J. Wild (1865-1923), as Managing Director until 1923. 1890 Became a public limited company. 1897 In June, subscriptions were invited from the public. Reeves is said to have acquired Lechertier Barbe, perhaps in 1898 when this business was incorporated as Lechertier Barbe Ltd and took on a branch at Brighton. 1912 the allotted capital employed by the business amounted to almost £115,000, of which £20,000 in ordinary shares was almost entirely held by the directors, four of whom were great-great-grandsons of the original Thomas Reeves. By then the freehold factory at Dalston was devoted solely to the manufacturer of artists' and students' colours, pastels, artists' brushes, and preparing canvases and other painting grounds. A leasehold factory at Belsham St, Hackney, was occupied as a woodworking shop for the manufacture of colour boxes, drawing boards, T squares, easels, palettes, etc, and another leasehold factory at Wayland Avenue, Hackney was used to produce sketchbooks, portfolios and other bookbinding work. By about 1934, the registered capital stood at £300,000 and a new factory had been erected at Bush Hill Park. Reeves's historic premises at 113 Cheapside, occupied since 1845, were destroyed by bombing in 1940 and their works at Dalston were badly damaged. The Greyhound Colour Works at Enfield were constructed on land acquired in 1921 and the manufacturing plant expanded by 1927; a new factory was built and the company's main offices moved there from Dalston in 1948. 29 Ludgate Hill EC, 1900-17. 178 High St Kensington 1934-60, 1975-84 (operated as Clifford Milburn 1960-76, as 'Reeves' 1980-87. 101 High Holborn 1903-11 (opening advertised The Studio 15 June 1903). Most of these outlets traded as Reeves' Artist Depots Ltd from 1902 to 1919. By 1960 and until 1976, Reeves's shops were managed by their retail subsidiary, Clifford Milburn Ltd.
Reeves's export markets in the mid-19th-century grew to include Peru, Brazil, Russia and the United States. Their trade catalogue of c.1899-1900, listed wholesale agents in Paris, Bombay, Melbourne, Buenos Aires and Santiago, while their c.1954 catalogue listed principal agents in Melbourne, Sydney, Colombo, Karachi, Lahore, Auckland, Cape Town and Johannesburg. Their products can be traced in trade catalogues published in various countries: Australia, Melbourne; Canada; France, Paris; the United States, New York. 1971 Reeves itself was the subject of a failed take-over bid by Heenan Beddow. 1974 Acquired by Reckitt and Colman and merged with Winsor and Newton, following Reckitt and Colman's acquisition in 1976. 2008 The Reeves brand is now owned by Wilhelm Becker, through Colart Fine Art and Graphics. This page was last edited on 9 December 2016, at 09:00.